While I have been contemplating about buying the new Samsung Chromebook for my mother, I have been contemplating, or re-contemplating I should say, my own personal computer uses and what do I need to satisfy my needs. My current MacBook Pro is still plowing along, though its AppleCare warranty is about to expire sometime in December and that makes me a little antsy. In general, gadgets tend to expire as soon as their warranties do. It’s quite a feat. The research and development teams of these electronics companies made a science out of this little trick. That isn’t to say that I’ve experienced this phenomenon as much as I am worrying about it. Most of my Apple products have in fact exceeded their warranties long past their abilities to stay out of the shadow of obsolescence. For instance, as I already mentioned in a previous post, my mom’s current computer is a little frustrating to use because the outdated web browsers on it just aren’t compatible with most current websites and there is no way to upgrade the software on the old PowerBook. Apple is the master of speeding up the obsolescence cycle of their devices. It’s a little frustrating using it at times and I consider myself a bit of a computer literate. My mom must be completely frustrated with that old computer at times. Of course my 2009 MacBook Pro isn’t quite there yet. I can upgrade my OS to Mountain Lion and have all the current bells and whistles that are being touted as Apple’s current standards. And even though it’s only $19.99 to upgrade I’m opting on looking towards my next computer. I know I definitely won’t be able to afford a new MacBook Pro and even the MacBook Air is out of my price range. I’m intrigued by the new Windows 8 interface, but I don’t want to deal with bloated antivirus programs that I have to keep running because that is the plight of a Windows user. 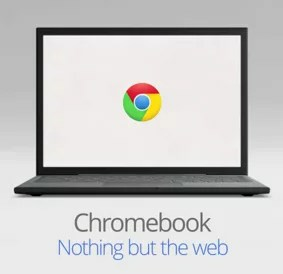 This is leading me to think that maybe a Chromebook isn’t a bad option to consider after all. I know I previously said that there are some applications that I currently use that would immediately eliminate Chromebook as a viable option but I’m re-assessing that notion and wondering if those applications are really that necessary. With this question bubbling in my mind I decided to undertake a little experiment without having to get rid of my safety-net that is my currently-still-under-warranty-MacBook-Pro. I discovered a blog entry that makes a viable argument to try it as your only computer, though it seems to be a little dated as he mentions which version of the Chromebook he’s using (CR-48, the first Chromebook I believe). He even mentions some Chrome extensions that would alleviate some of my concerns such as cloudHQ which would sync my Good Drive with Dropbox and make all my digital files accessible and easy to email without too much fuss. Or so that is the working theory. Because of this I decided I’m going try to live through my Google Chrome Browser (which is pretty much the Chrome OS in a nutshell) without using other apps on my computer. Currently as I’m typing this, I’m playing my music on another tab through Google Music, cloudHQ is in the process of syncing Google Drive with Dropbox. So far so good. If this experiment is a success I’ll know that I won’t have to spend more than $249 for my next computer to do all the things I normally do and I won’t ever have to fear obsolescence as much I did with Apple products, for Google promises to keep all models of Chromebook updated and forward compatible. And with $249 being my only expense, whenever my hardware does crap out, it won’t be as hard to buy another one and I won’t have to fear for any of my stuff being lost since it’s all in the Cloud to begin with. We shall see how this experiment plays out.